languagehat.com : AN AFTERNOON WITH COWAN. John Cowan was in the area with his wife, so we arranged to meet (at Amherst Books, of course; he, like me, can happily spend hours in a bookstore, so it didn’t matter who got there first). We spent several hours wandering around the town and talking; I showed him Emily Dickinson’s house, the Black Sheep deli, and the Amherst College campus, where we discovered that the Frost Library would let us in without making us show ID, and for a while we were each holding biographical dictionaries of China, reading each other particularly piquant entries (one of them described Cao Cao as a “young thug”) and laughing perhaps too loudly for the library setting. He liked the Common, where he showed me how to identify various kinds of trees; he also convinced me to try using an RSS reader, and suggested I upgrade to a less antediluvian version of Movable Type and use reCAPTCHA to keep the spammers away. He told me about Project Wombat, and we traded stories from The Oxford Book of Literary Anecdotes , for which it turns out we have a mutual enthusiasm. In short, a good time was had by all. And yes, of course I got more books at Amherst Books, including Russia’s Alternative Prose , by Robert Porter, and A Russian Cultural Revival: A Critical Anthology of Emigre Literature Before 1939 , by Temira Pachmuss. I’m incorrigible. Amherst! I just learned some shocking information about what goes on in Amherst from a review of two new books about Emily Dickinson in the London Review of Books. But in truth our conversation touched on many topics; it was a rollicking but unsummarizable seminar, which I described to my wife afterwards as “a gossip session, but about ideas instead of people.” I was particularly fascinated with his explanation of how he gets his free-lance work (editors recommend him to their friends, in short), which led me to an account of how all my jobs but the first have come from personal recommendations. For clarity, when Hat says “we” he means “he and I”, not “he, my wife, and I”; she went to see The Tree of Life (2011) at Amherst Cinema with a friend. She liked it very much; her friend thought it stunk. Ah well, three of us were happy. hey friends i too like this type of post. And I bet you have better teeth. And if he doesn’t, I’ll bet his goats do. Hm, maybe I’ll visit that theater myself; I loved Malick’s last movie, and The Tree of Life sounds intriguing. I thought this was span, but I’m simple-minded; maybe it was deliberate. I’ve come back from a drinking session with an Inner Mongolian in which we discussed how to survive among the Han-zu. I’m afraid it wasn’t morally pretty or uplifting, and I guess I find myself sniggering with LH. I assume AJP was paying homage to a piece of genuine spam that has been deleted. It would be nice to get the threaded comments a la Livejournal that come with the newer version of Movable Type. The New Oxford Book of Literary Anecdotes seems easier to find than The Oxford Book of Literary Anecdotes. I’ll probably try to grab both. Somehow I’m reminded of A Random Walk in Science and More Random Walks in Science. Good times. @Steven Lubman: Could threading accommodate the non-tree structure of so may LH comment flows? And now the teeth jokes seems out of plaque. I personally hate threaded comments with a passion. I prefer threading of mail exchanges and Usenet discussions, but that’s another world. Here under Hat’s brim the loose flow of comments, with everyone adding freely to some or all of the above, is one of the great pleasures of reading. In unusually long threads I’ve missed a numbering system or something like that to make it easier to navigate the thread, but that’s about it. 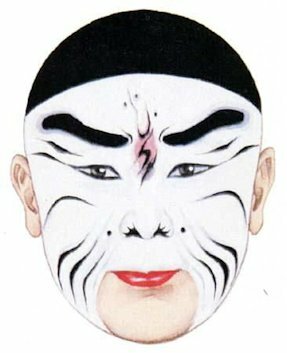 Cao Cao, besides being a gangster-warlord, near-Emperor, and novel-and-opera villain (here), was responsible (along with his two sons) for establishing five-syllable shi poetry as the official poetry of the Chinese literati. (Before then the official poetry had been four-syllable shi, sao poetry, and fu poetry). That sounds pedantic, but when you think of a group of Chinese gentlemen sitting together, drinking wine, and reciting poems to one another, it’s shi poetry you’re thinking of, and that sort of social event became customary at the court of the Cao dynasty (Sanguo Wei). HIs own poems are remarkable but not like anyone else’s, and since he was a political villain (because of a mixture of failure and evil), he both is and isn’t part of the canon. He’s a poet everyone should know, but everyone should also know that he’s not part of the canon. If everyone should know him, he is part of the canon, no? Maybe in a walled-off section. One of them paradoxes, son. Speak of Cao Cao and Cao Cao arrives. If only I’d known that when we had a chow chow. I doesn’t work with our Terje. Hat spoke of Cowan after he arrived. DIENY, Jean-Pierre, Les poemes de Cao Cao (155-220). Paris: College de France, Institut des Hautes Etudes Chinoises, 2000. Highly recommended. Very detailed background information, OK French translations. For at least two years (maybe four? or five? I’ve totally lost count) I’ve been following this and a hundred other blogs and webcomics in my Google Reader rss aggregator. It’s not the only agg out there, but I like how it works, and regardless of which agg I might use, I can guarantee that I am now incapable of following any sort of periodically updated content that doesn’t have a feed. I can read at my leisure, and Reader remembers what I have and haven’t read, so if I have to afk for a week or three, all my ‘bookmarks’ (not actual bookmarks but you know, the list of what I haven’t read) are saved and I can pick up right where I left off, no time wasted combing through already-read or not-yet-read content, looking for the exact spot where I stopped. If the agg you initially try doesn’t suit your tastes, try others until you find a display you like; but IMnvHO RSS feeds are the only good way to consume blog-style web content anymore. Yeah, I don’t know how I got along without it. I’m using Google Reader, and it saves me god knows how much time and aggravation. No more clicking daily on [blog whose owner only updates once in a blue moon], muttering in frustration, then giving up only to try months later and discovering there are fifty new posts! I may be an old fogy stuck in my ways, but I know a good thing when I see it. Thanks, John Cowan!